The 12" Pizza Pan. What can we say but Bon Appetit! Enjoy delicious pizza, fresh or frozen, baked in oven or toaster oven! Finally! The pan has two layers of ceramic coating that makes it both durable and easy to clean. The cream colored non-stick baking surface is PTFE Free, Cadmium Free, Lead Free, PFOA Free, and PFOS Free. 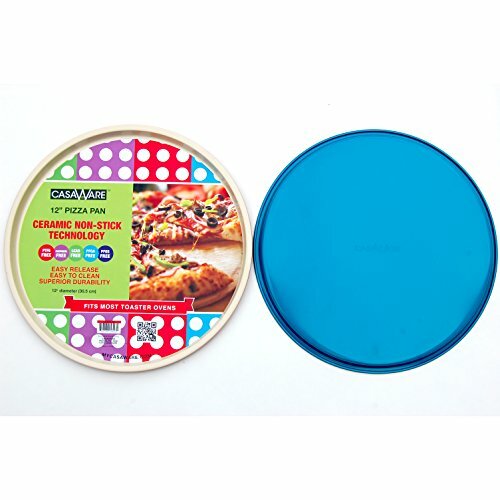 The base of the pan is a fashioned colored high heat resistant non-stick. The 12" Pizza Pan can be used in both a traditional oven and toaster ovens. Product dimensions: 12-Inch diameter. The 12 Pizza Pan can be used in both a traditional oven and toaster ovens. Hand Washing recommended, do not immerse in water. Do not microwave. Refer to product description for Use & Care Instructions.